No hot air in front or rear of cabin. Both heater hoses are hot to the touch. New thermostat installed. Flushed radiator system and added new antifreeze. The blend door is working properly. The accumulator motor was replaced last year. The only time it starts to get slight warm air is when you push the Vent Button. Do you have any suggestions? Need help! It sounds like the HVAC control head is not working right but the be sure here are the wiring diagrams for the system so we can see how it works and to test the ground and power leads. The guide will get us started. Yes the door do leak a little that is normal. 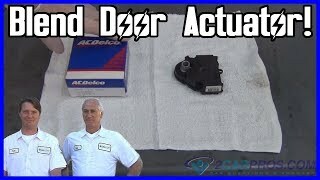 It sounds like the electric blend door is not working right I would try replacing it first. Here are diagrams to helps you. Check out the diagrams (Below). Please let us know what happens. Can you define "working right"? Are you referring to the temperature, because the door seems to be opening and closing properly. Why wouldn't the temperature change accordingly? I have a hole cut in the housing I can see the temperature blend door moving. That is how I was able to tell you what it was doing in my last email to you. So please tell me why you want me to replace it (blend door actuator) it was replace last year. Thank you again, Chuck. I am thinking the actuator because they had problems with them in the shop can you tell me if it was an OEM part it was replaced with? If both heater hoses are hot then it you should be able to remove the actuator and move the door by hand to get full heat. Can you try that? Here is a guide to help you see what I am talking about. Well its not the blend door or the actuator they are working fine. The water pump fins are all gone (gone) the coolant cannot be moving very much. So new water pump. 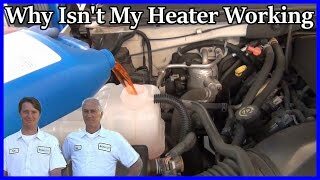 Had the radiator boil out, now get some warm air not hot. Now it heater core replacement time. Thanks for the information. Wow good find, usually the engine will overheat when this happens. Here are diagrams to help you change out the heater core. You will need to vacuum down and recharge the AC system. The car only got a little warm when the A/C on and going up a large hill. Turn the A/C off when you started up a hill hard to believe it did not overheat all the time it is driven two and half hours one way to work on Tuesday then the same on Thursday coming home for the last two years. (Never overheated) (Unbelievable) Now can you tell me how to test a ambient temperature sensor the one inside the dash? Thank you! They are not giving how to test it just how to replace it, here are diagrams to help. Check out the diagrams (below). Please let us know what you find. Okay, heater core is out and new one in. Now putting the dash back together. Here is a tip if you are replacing the heater core when your in the heater box if you cut the metal lines with a hacksaw then pull them through the fire wall it make it a lot easier to remove the hoses from the old core. You do not have to open the A/C system. I was able to do my without opening any lines. All back together and glad to report, all is well heater gets good and hot. Now if I could only get the sirius radio working again that would be great. Please post your new question here, you must be logged in. My car does not heat in front only in back. Can you please help? 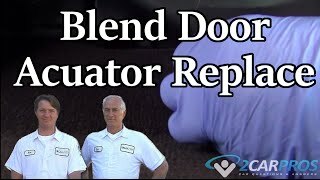 It might be blend door actuator but because you have automatic temperature control you have to scan for codes to see what is causing it or not. A mechanic has to do it. You can try pulling fuse for sixty seconds with key on then reinstall it may reset it. My heater doesn't work in the front only blows out cold air, but works in the back. With the engine at full operating temp, locate the 2 heater hoses where they go into the firewall and feel them to see if they are both hot to the touch. If they are both hot, the heat in that vehicle is controlled by a blend door that regulates heated air flow. It is operated by an electric motor/actuator. The problem can be that the actuator is stripped or inoperative or the door itself could be damaged. This is what needs to be determined by examining the actuator and see if it is responding to heat change commands or not. In the engine compartment is the only place you have access to those lines.